One hundred years ago Jane Addams stood beside presidential candidate Teddy Roosevelt and advocated for women’s rights. The first woman to receive the Nobel Peace Prize was a tireless activist for social justice, an extraordinary intellectual and in the words of J. Edgar Hoover, “The Most Dangerous Woman in America”. Jane Addams’ visionary journey was launched from a tiny rocking chair still on view in her former home in Chicago. The childhood rocker where she learned to read embodies the essence of her lifelong crusade to bring education, equality, and solidarity to humanity. 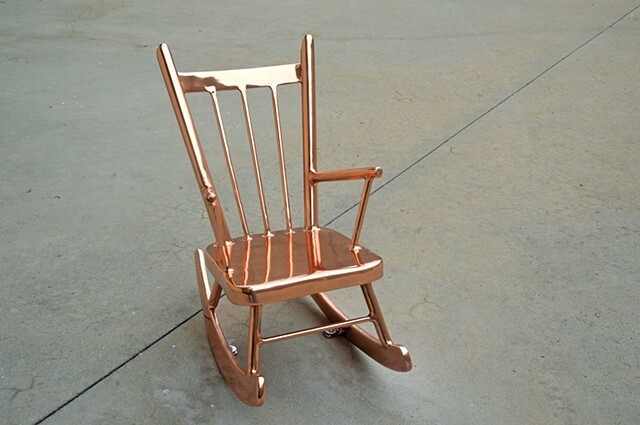 A copper plated steel replica of Jane Addams’ Chair has not been placed on a plinth or base, but rather sits directly on the concrete pavement. It appears dwarfed by the large concrete plaza and surrounds. 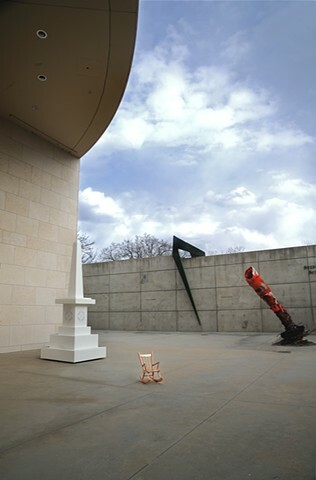 The juxtaposition of materials and scale intentionally contradicts conventional norms of monumentality providing a connection to the humble beginnings we all share.